Summary: A novel is a story transmitted from the novelist to the reader. It offers distraction, entertainment, and an opportunity to unwind or focus. But it can also be something more powerful—a way to learn about how to live. Read at the right moment in your life, a novel can—quite literally—change it. Have you ever wondered why you read? I certainly have! It's a wonderful way for me to escape. Sometimes I "visit" exciting places. Other times, I "meet" really amazing people. And if I'm lucky, sometimes I can get caught up in a story and forget everything for a few hours. To me, that's the beauty of novels. 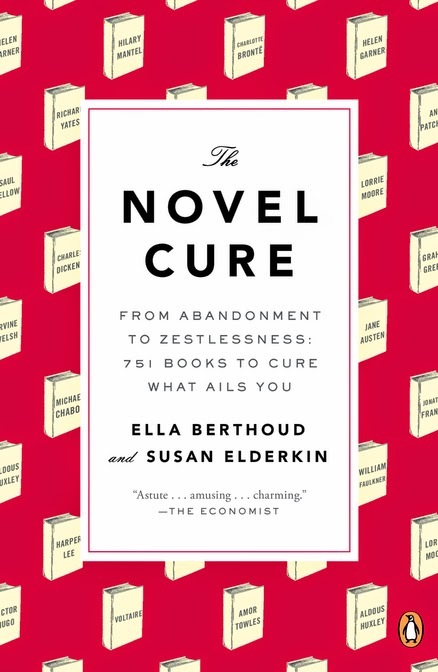 Ella Berthoud and Susan Elderking, the authors of THE NOVEL CURE: FROM ABANDONMENT TO ZESTLESSNESS: 751 BOOKS TO CURE WHAT AILS YOU, have found an entirely new reason to read novels; and I think it's terrific! Their new book has reading suggestions based on what ails you... in other words, bibliotherapy. THE NOVEL CURE has book advice for almost any feeling or event I can think of including depression, lack of courage, childbirth, addiction, and more. There are even book recommendations for control freaks and being a genius! I have to admit that I didn't read this book through from the first to the last page; however, I'm pretty sure that's not the idea of the book. Rather, I consider THE NOVEL CURE to be a reference book of sorts. I actually skimmed the book to get an idea of the "ailments" and the recommendations, and then I went back and looked up some of my feelings to see what I should be reading. There were some well-known novels and then quite a few that I had never heard of as well as both classic and contemporary ones -- basically, a great mix and definitely something for everyone. Berthoud and Elderking have really created an interesting book... and a great gift idea for the upcoming holiday season. I was so impressed to learn that they searched through 2,000 years of literature for find the best matches. I thought it was a lot of fun to see their recommendations (as well as their list of ailments); and I found that once I started skimming the book, I couldn't stop reading it. I have a feeling that book lovers are going to truly appreciate this book! THE NOVEL CURE is arranged in alphabetical order by ailment, and there is also an index in the back. Believe me when I say that this book is thorough! In addition to offering reading recommendations, this book also has some great lists like "The Ten Best Escapist Novels" and "The Ten Best Novels to Be Read in the Hospital." I honestly loved everything about this book and can't decide what I appreciated more -- the recommendations or the compilations. Giveaway alert: I have a copy of THE NOVEL CURE to share with one lucky reader. To enter, just fill out the form below before December 21st at 11:59 p.m. EST. I will notify the winner the following day. This contest is open to those of you with U.S. addresses only. Good luck! Terrific review! Thank you for offering this giveaway. Thanks for the tip - you just solved my quest to find a gift for two important birthdays I have coming up in January! This sounds incredible!!! Love it!